For the Brazilian dance, see Samba (Brazilian dance). For other uses, see Samba (disambiguation). Not to be confused with Sambo or Zamba. Samba (Portuguese pronunciation: [ˈsɐ̃bɐ] ( listen)) is a Brazilian music genre and dance style, with its roots in Africa via the West African slave trade and African religious traditions, particularly of Angola and the Congo, through the samba de roda genre of the northeastern Brazilian state of Bahia, from which it derived. Although there were various forms of samba in Brazil with popular rhythms originated from drumming, samba as a music genre has its origins in Rio de Janeiro, the former capital of Brazil. Samba is recognized around the world as a symbol of Brazil and the Brazilian Carnival. Considered one of the most popular Brazilian cultural expressions, samba has become an icon of Brazilian national identity. The Bahian Samba de Roda (dance circle), was added to the UNESCO Intangible Cultural Heritage List in 2005. It is the main root of the samba carioca, the samba that is played and danced in Rio de Janeiro. Composed by Assis Valente, recorded by Carmen Miranda in 1939. Patrício Teixeira e Trio T.B.T. recorded in 1932. (composed by Pixinguinha and Cícero de Almeida). Mario Reis (singer), released in 1933. The modern samba that emerged at the beginning of the 20th century is predominantly in a 2/4 time signature varied with the conscious use of a sung chorus to a batucada rhythm, with various stanzas of declaratory verses. Traditionally, the samba is played by strings (cavaquinho and various types of guitar) and various percussion instruments such as tamborim. Influenced by American orchestras in vogue since the Second World War and the cultural impact of US music post-war, samba began to use trombones, trumpets, choros, flutes, and clarinets. In addition to distinct rhythms and meters, samba brings a whole historical culture of food, varied dances (miudinho, coco, samba de roda, and pernada), parties, clothes such as linen shirts, and the Naif painting of established names such as Nelson Sargento, Guilherme de Brito, and Heitor dos Prazeres. Anonymous community artists, including painters, sculptors, designers, and stylists, make the clothes, costumes, carnival floats, and cars, opening the doors of schools of samba. There is also a great tradition of ballroom samba in Brazil, with many styles. Samba de Gafieira is the style more famous in Rio de Janeiro, where common people used to go to the gafieira parties since the 1930s, and where the moves and identity of this dance have emerged, getting more and more different from its African, European and Cuban origins and influences. The Samba National Day is celebrated on December 2. The date was established at the initiative of Luis Monteiro da Costa, an Alderman of Salvador, in honor of Ary Barroso. He composed "Na Baixa do Sapateiro" even though he had never been in Bahia. Thus 2 December marked the first visit of Ary Barroso to Salvador. Initially, this day was celebrated only in Salvador, but eventually it turned into a national holiday. Samba is a local style in Southeastern Brazil and Northeast Brazil, especially in Rio de Janeiro, São Paulo, Salvador and Recife. Its importance as Brazil's national music transcends region, however; samba schools, samba musicians and carnival organizations centered on the performance of samba exist in every region of the country, even though other musical styles prevail in various regions (for instance, in Southern Brazil, Center-West Brazil, and all of the Brazilian countryside, Sertanejo, or Brazilian country music, is the most popular style). The Portuguese verb sambar, to do joiner's work; and the Portuguese noun sambúco (Latin sambuca), a historic string instrument, a kind of harp or lyre. It is uncertain whether the African Semba dance is related to the Brazilian Samba, and whether it is older or newer, beyond the superficial similarity of name and style. In only two Bantu languages does the verb-root "semba" mean "dance", while in others it denotes unrelated things like "hunger" or "cloth" (but not "belly"). One of the oldest records of the word samba appeared in Pernambuco magazine's O Carapuceiro, dated February 1838, when Father Miguel Lopes Gama of Sacramento wrote against what he called "the samba d'almocreve" – not referring to the future musical genre, but a kind of merriment (dance drama) popular for black people of that time. According to Hiram Araújo da Costa, over the centuries, the festival of dances of slaves in Bahia were called samba. 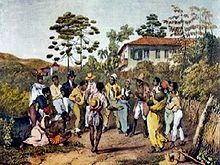 In the middle of the 19th century, the word samba defined different types of music made by African slaves when conducted by different types of Batuque, but it assumed its own characteristics in each Brazilian state, not only by the diversity of tribes for slaves, but also the peculiarity of each region in which they were settlers. Some of these popular dances were known as Baião, Bochinche, Candombe (Candomblé), Catêrêtê, Caxambú, Choradinho, Côco-inchádo, Cocumbí, Córta-jáca, Cururú, Furrundú, Jongo, Lundú, Maracatú, Maxíxe, Quimbête, São-Gonçalo, Saramba; not to mention the many varieties of the Portuguese Fandango, and the Indio dance Puracé. In Argentina, there is a dance called "zamba", a name which seems to share etymological origins with the samba, but the dance itself is quite different. Samba-enredo or samba de enredo is a subgenre of Samba in which songs are performed by a samba school (or escola de samba) for the festivities of Brazilian Carnival. "Samba-enredo" translates literally in Portuguese to "samba in song", or "song samba". Each samba school creates a new samba-enredo in advance of the next year's Carnaval, which is selected by competition, to be performed in the final Carnaval parades and events leading up to Carnaval. For each samba school, choosing the following year's samba-enredo is a long process. Well in advance of the Carnaval parade, each samba school holds contests for writing the song. The song is written by samba composers from within the school itself, ("Ala dos Compositores") or sometimes from outside composers, normally in "parcerias"(partnerships). Each school receives many—sometimes hundreds—songs, hoping to be the next samba-enredo for that year. The samba-enredo is written by these numerous composers mentioned above only after the Carnival Art Director, or "Carnavalesco" officially publishes the samba school's parade theme synopsis for the year. After a careful explanation of the parade-theme, many times done by the Carnival Art Director himself, composers may ask questions in order to clarify the synopsis, so they could start writing the samba-enredos. The schools select the song by process of elimination and usually end up somewhere between five and ten songs. Around this time, the finalist samba-enredos are played with music and are voted on by the leaders of the samba school and the carnavalesco—the director of the school for Carnaval. After months of deliberation, the new samba-enredo is chosen and becomes the voice of the samba school for the next year's Carnaval. The most important night in this process, is called the "final de samba", or samba final, when the samba school decides between two or three samba-enredos. At the end of the process, the winning samba-enredo is selected, and it is this song that is sung during the school's parade in the sambadrome. This process normally happens in Brazil from August until November, and today is highly professionalized, with samba-composers hiring fans, producing CDs, banners, and throwing parties to promote their samba-enredo. It is important to note that the samba-enredo is one of the criteria used by the Judging committee to decide who is the winner of the Carnaval parade competition. The samba-enredo must be well sung by the samba school's puxador (or singer) or the school will lose points. While the puxador sings, everyone marching in the Carnaval parade sings the samba-enredo along with him, and harmony is another judging criterion. Although samba exists throughout Brazil – especially in the states of Bahia, Maranhão, Minas Gerais, and São Paulo – in the form of various popular rhythms and dances that originated from the regional batuque of the eastern Brazilian state of Bahia, a music form from Cape Verde, samba is frequently identified as a musical expression of urban Rio de Janeiro, where it developed during the first years of the 20th century. Early styles of samba - and specifically samba de roda - are traced back to the Recôncavo region of Bahia during the 17th century, and the informal dancing following a candomblé ceremony. It was in Rio de Janeiro that the dance practiced by former slaves who migrated from Bahia came into contact with and incorporated other genres played in the city (such as the polka, the maxixe, the lundu, and the xote), acquiring a completely unique character and creating the samba carioca urbana (samba school) and carnavalesco (Carnaval school director). Samba schools are large organizations of up to 5,000 people which compete annually in the Carnival with thematic floats, elaborate costumes, and original music. During the first decade of the 20th century, some songs under the name of samba were recorded, but these recordings did not achieve great popularity. However, in 1917, "Pelo Telefone" ("By Telephone") was recorded, and it is considered the first true samba. The song was claimed to be authored by Ernesto dos Santos, best known as Donga (musician) [pt; de], with co-composition attributed to Mauro de Almeida, a well-known Carnival columnist. Actually, "Pelo Telefone" was created by a collective of musicians who participated in celebrations at the house of Tia Ciata (Aunt Ciata). It was eventually registered by Donga and the Almeida National Library. "Pelo Telefone" was the first composition to achieve great success with the style of samba and to contribute to the dissemination and popularization of the genre. From that moment on, samba started to spread across the country, initially associated with Carnival and then developing its own place in the music market. There were many composers, including Heitor dos Prazeres, João da Bahiana, Pixinguinha, and Sinhô, but the sambas of these composers were "amaxixados" (a mix of maxixe), known as sambas-maxixes. The contours of the modern samba came only at the end of the 1920s, from the innovations of a group of composers of carnival "blocks" (groups) in the neighborhoods of Estácio de Sá and Osvaldo Cruz, and the hills of Mangueira, Salgueiro, and São Carlos. Since then, there have been many great names in samba, such as Ismael Silva, Cartola, Ary Barroso, Noel Rosa, Ataulfo Alves, Wilson Batista, Geraldo Pereira, Zé Kéti, Candeia, Ciro Monteiro, Nelson Cavaquinho, Elton Medeiros, Paulinho da Viola, Martinho da Vila, and many others. As the samba consolidated as an urban and modern expression, it began to be played on radio stations, spreading across the hills and neighborhoods to the affluent southern areas of Rio de Janeiro. Initially viewed with prejudice and discrimination because it had black roots, the samba, because of its hypnotic rhythms and melodic intonations in addition to its playful lyrics, eventually conquered the white middle class as well. Other musical genres derived from samba, such as samba-canção, partido alto, samba-enredo, samba de gafieira, samba de breque, bossa nova, samba-rock, and pagode, have all earned names for themselves. The samba is frequently associated abroad with football and Carnaval. This history began with the international success of Aquarela do Brasil, by Ary Barroso, followed by Carmen Miranda (supported by Getúlio Vargas government and the US Good Neighbor policy), which led samba to the United States. Bossa nova finally entered the country into the world of samba music. Brazilian percussionist and studio musician Paulinho Da Costa, currently based in Los Angeles, incorporates the rhythms and instrumentation of the samba into the albums of hundreds of American, European and Japanese artists — including producer Quincy Jones, jazz performer Dizzy Gillespie, pop singer Michael Jackson and vocalist Barbra Streisand. The success of the samba in Europe and Japan only confirms its ability to win fans, regardless of their language. Currently, there are hundreds of samba schools on European soil and scattered among countries like Germany, Belgium, Netherlands, France, Sweden, and Switzerland. Already in Japan, the records invest heavily in the launch of former sambistas' set of discs, which eventually created a market composed solely of catalogs of Japanese record labels. From the second half of the 19th century onward, as blacks, mestizas, and ex-soldiers of the War of Canudos in Rio de Janeiro came from various parts of Brazil (mainly Bahia) and settled in the vicinity of Morro da Conceição, Pedra do Sal, Praça Mauá, Praça Onze, Cidade Nova, Saúde, and Zona Portuária. These stands form poor communities that these people called the favelas (later the term became synonymous with the irregular buildings of the poor). These communities would be the scene of a significant part of Brazilian black culture, particularly with respect to Candomblé and samba amaxixado at that time. Among the early highlights were the musician and dancer Hilário Jovino Ferreira—responsible for the founding of several blocks of afoxé and Carnival's ranchos—and Tias Baianas, a term given to the female descendants of Bahian slaves. Thus, the samba and musical genre was born in the houses of Tias Baianas (Bahian aunts) in the beginning of the 20th century, as a descendant of the style lundu of the candomblé de terreiro parties between umbigada (Samba) and capoeira's pernadas, marked in pandeiro, prato-e-faca (plate-and-knife) and in the palmas, hand claps. There are some controversies about the word samba-raiado, one of the first appointments to the samba. It is known that the samba-raiado is marked by the sound and accent sertanejos / rural brought by "Tias Baianas" to Rio de Janeiro. According to João da Baiana, the samba-raiado was the same as chula raiada or samba de partido-alto. For the sambist Caninha, this was the first name would have heard at the home of Tia Dadá. At the same time, there were the samba-corrido, a line that had more work together with the rural Bahian accent, and the samba-chulado, a more rhyming and melodic style that characterized the urban samba carioca. By the 1870s, Republican propagandists were attempting to prohibit samba on the pretext that folklorist dances shamed Brazil's national image. It would take the edict of a federal administration to halt the persecution of neighborhood samba groups and to recognize officially their parades. Later, the views of anthropologist Gilberto Freyre, and Getrllio Vargas, who became Brazil's new populist president in 1930, provided the country with fresh perspectives on racial mixing. Under Vargas, samba schools and carnaval parades were supported by the state and quickly established themselves all over Brazil. Samba significantly benefited from these political efforts to create a homogeneous national culture. While certain types of music suggested different racial or class origins, samba dissipated social antagonisms and helped unify a society that varied in its origins, appearance, and ways of living and thinking. Samba's triumph over the airwaves allowed it to penetrate all sectors of Brazilian society. According to anthropologist Hermano Vianna, configuring Samba as a symbol of Brazilianness was possible thanks to the cultural exchange between the working classes and intellectual elite. He cites a guitar meeting between anthropologist Gilberto Freyre, the historian Sérgio Buarque de Holanda, promoter and journalist Prudente de Moraes Neto, the classical composer Villa Lobos and pianist Lucio Gallet, all representative of the intellectual and cultural elite of white origin on the one hand; and Pixinguinha musician and composers / samba Donga and Patrick Teixeira, from the popular and crossbred layers on the other, saying how the occasion marked the meeting of two different or even opposing groups of Brazilian society. The urban carioca samba is the anchor of 20th century "Brazilian samba" par excellence. However, before this type of samba was to consolidate as the "national samba" in Brazil, there were traditional forms of sambas in Bahia and São Paulo. The rural Bahia samba acquired additional names as choreographic variations – for example, the "samba-de-chave", where the soloist dancer faking looking roda in the middle of a key, and when found, was replaced. [clarification needed] The poetic structure of Bahian samba followed the way call-and-response—composed of a single verse, a solo, followed by another, and repeated by the chorus of dancers as the falderal. With no chorus, the samba is called samba-corrido, which is an uncommon variant. The chants were taken by one singer, one of the musicians, or soloist dancer. Another peculiarity of Bahian samba was a form of competition that dances sometimes presented: it was a dispute between participants to see who performed better. Besides the umbigada, common to all the bahianian samba, the Bahia presented three basic steps: corta-a-jaca, separa-o-visgo, and apanha-o-bag. There is also another choreographic element danced by women: the miudinho (this also appeared in São Paulo, as dance solo in the center of the roda). The instruments of the Bahian samba were pandeiros, shakers, guitars, and sometimes the castanets and berimbaus. In São Paulo state, samba became the domain of blacks and caboclos. In rural areas, samba can occur without the traditional umbigada. There are also other choreographic variations—the dancers may be placed in rows with men on one side and women on another. The instruments of the samba paulista were violas and pandeiros. It is possible that the early provision of the roda, in Goiás, has been modified by the influence of quadrilha or cateretê. According to historian Luís da Câmara Cascudo, it is possible to observe the influence of city in the samba, by the fact that it is also danced by pair connections. One of the most noticeable groups of São Paulo's samba, Demônios da Garoa (Drizzle's Demons), had a strong link with Adoniran Barbosa, who composed their songs. Songs like "Samba do Arnesto" and "Saudosa Maloca" became legendary, recognized as "the real Samba Paulistano". The group is still active, but with a different lineup. In 2000, one of their most famous songs, "Trem das Onze", was elected as an official symbol of the city of São Paulo. Meanwhile, other recordings have been done as samba before Pelo Telefone, as this composition was done by double Donga / Mauro de Almeida, who is regarded as a founder of the genre. Still, the song is written and discussed, and its proximity to the maxixe made it finally be designated samba-maxixe. This section was influenced by maxixe dance and basically played the piano—unlike the Rio samba played in the Morros hills—and the composer has musician Sinhô, self-titled o rei do samba ("the king of Samba") which with other pioneers such as Heitor dos Prazeres and Caninha, lay the first foundations of the musical genre. The growing shantytowns (favelas) in the hills of suburban Rio would become the home of new musical talents. Almost simultaneously, the samba carioca, which was born in the city center, would climb the slopes of the hills and spread outside the periphery, to the point that, over time, it came to be identified as samba de morro (samba from the hills). At the end of the 1920s, the carnival samba of blocks of the districts Estácio de Sá and Oswaldo Cruz was born, and in the hills of Mangueira, Salgueiro, and São Carlos, there were innovations in rhythmic samba that persist until the present day. This group, the Turma do Estácio, from which would arise Deixa Falar, was the first samba school in Brazil. Formed by some composers in the neighborhood of Estácio, including Alcebíades Barcellos (aka Bide) Armando Marçal, Ismael Silva, Nilton Bastos and the more "malandros" such as Baiaco, Brancura, Mano Edgar, Mano Rubem, the "Turma do Estácio" marked the history of the Brazilian samba by injecting more pace to the genre one performed, which has the endorsement of the youth's middle class, as the ex-student of law Ary Barroso and former student of medicine Noel Rosa. Initially a "pt:rancho carnavalesco", then a Carnival block, and finally a samba school, the Deixa Falar was the first to Rio Carnival parade in the sound of an orchestra made up of percussion surdos, tambourines, and cuícas, who joined pandeiro and shakers. This group was instrumental and is called bateria, and it lends itself to the monitoring of a type of samba that was quite different from those of Donga, Sinhô, and Pixinguinha. The samba of Estácio de Sá signed up quickly as the samba carioca par excellence. The Turma do Estácio has made the appropriate rhythmic samba were so it could be accompanied in the carnival's parade, thus distancing the progress samba-amaxixado of composers such as Sinhô. Moreover, its rodas of samba were attended by composers from other Rio hills, as Cartola, Carlos Cachaça, and then Nelson Cavaquinho, e Geraldo Pereira, Paulo da Portela, Alcides Malandro Histórico, Manacéia, Chico Santana, and others. Accompanied by a pandeiro, a tambourine, a cuíca and a surdo, they created and spread the samba-de-morro. Portuguese Brazilian singer Carmen Miranda helped popularize samba internationally. After the founding of "Deixa Falar", the phenomenon of the samba schools took over the scene and helped boost Rio's samba subgenera of Partido Alto, singing and challenging in candomblé terreiros the samba-enredo. From the 1930s, the popularization of radio in Brazil helped to spread the samba across the country, mainly the subgenres samba-canção and samba-exaltação. The samba-canção was released in 1928 with the recording "Ai, yo-yo" by Aracy Cortes. Also known as "samba half of the year", the samba-canção became established in the next decade. It was a slow and rhythmic samba music and had an emphasis on melody and generally easy acceptance. This aspect was later influenced by the rhythms of foreigners, first by foxtrot in the 1940s and then bolero the 1950s. The most famous composers were Noel Rosa, Ary Barroso, Lamartine Babo, Braguinha (also known as João de Barro), and Ataulfo Alves. Other practitioners of this style were Antonio Maria, Custódio Mesquita, Dolores Duran, Fernando Lobo, Ismael Neto, Lupicínio Rodrigues, Batatinha, and Adoniran Barbosa (this latter by sharply satirical doses[clarification needed]). The ideology of Getúlio Vargas's Estado Novo changed the scene of the samba. With Aquarela do Brasil, composed by Ary Barroso and recorded by Francisco Alves in 1939, the samba-exaltação become the first success abroad. This kind of samba was characterized by extensive compositions of melody and patriotic verses. Carmen Miranda popularized samba internationally through her Hollywood films. With the support of the Brazilian president Getúlio Vargas, the samba won status as the "official music" of Brazil. With this status of national identity came the recognition of the intellectual and classical composer Heitor Villa-Lobos, who arranged a recording with the maestro Leopold Stokowski in 1940, which involved Cartola, Donga, João da Baiana, Pixinguinha, and Zé da Zilda. Also in the 1940s, there arose a new crop of artists: Francisco Alves, Mário Reis, Orlando Silva, Silvio Caldas, Aracy de Almeida, Dalva de Oliveira, and Elizeth Cardoso, among others. Others such as Assis Valente, Ataulfo Alves, Dorival Caymmi, Herivelto Martins, Pedro Caetano, and Synval Silva led the samba to the music industry. A movement was born in the southern area of Rio de Janeiro, strongly influenced by jazz, marking the history of samba and Brazilian popular music in the 1950s. The bossa nova emerged at the end of that decade, with an original rhythmic accent which divided the phrasing of the samba and added influences of impressionist music and jazz and a different style of singing which was both intimate and gentle. After precursors such as Johnny Alf, João Donato, and musicians like Luis Bonfá and Garoto, this subgenre was inaugurated by João Gilberto, Tom Jobim, and Vinicius de Moraes. It then had a generation of disciples and followers including Carlos Lyra, Roberto Menescal, Durval Ferreira, and groups like Tamba Trio, Bossa 3, Zimbo Trio, and The Cariocas. The sambalanço also began at the end of the 1950s. It was a branch of the popular bossa nova (most appreciated by the middle class) which also mingled samba rhythms and American jazz. Sambalanço was often found at suburban dances of the 1960s, 1970s, and 1980s. This style was developed by artists such as Bebeto, Bedeu, Scotland 7, Djalma Ferreira, the Daydreams, Dhema, Ed Lincoln, Elza Soares, and Miltinho, among others. In the 21st century, groups like Funk Como Le Gusta and Clube do Balanço continue to keep this subgenre alive. In the 1960s, Brazil became politically divided with the arrival of a military dictatorship, and the leftist musicians of bossa nova started to gather attention to the music made in the favelas. Many popular artists were discovered at this time. Musicians like Cartola, Nelson Cavaquinho, Guilherme de Brito, Velha Guarda da Portela, Zé Keti, and Clementina de Jesus recorded their first albums during this time. In the 1970s, samba returned strongly to the air waves with composers and singers like Paulinho da Viola, Martinho da Vila, Clara Nunes, and Beth Carvalho dominating the hit parade. Great samba lyricists like Paulo César Pinheiro (especially in the praised partnership with João Nogueira) and Aldir Blanc started to appear around that time. With bossa nova, samba is further away from its popular roots. The influence of jazz deepened, and techniques have been incorporated from classical music. From a festival in Carnegie Hall of New York, in 1962, the bossa nova reached worldwide success. But over the 1960s and 1970s, many artists who emerged—like Chico Buarque, Billy Blanco, Martinho da Vila, and Paulinho da Viola—advocated the return of the samba beat in its traditional form. They also wanted veterans like Candeia, Cartola, Nelson Cavaquinho, and Zé Kéti to return. In the early 1960s, the "Movement for Revitalization of Traditional Samba", promoted by Center for Popular Culture, started in partnership with the Brazilian National Union of Students. During the 1960s, some samba groups appeared and were formed by previous experiences with the world of samba and songs recorded by great names of Brazilian music. Among them were The Cinco Crioulos, The Voz do Morro, Mensageiros do Samba, and The Cinco Só. Outside the main scene of the Brazilian Popular Music festivals, the sambists founded the Bienal do Samba in the late 1960s, and it became the space for the big names of the genre and followers. Even in the final decade, the samba-empolgação (samba-excitement) of carnival blocks Bafo da Onça, Cacique de Ramos, and Boêmios de Irajá came into being. Also in the 1960s came the samba funk. The samba-funk emerged at the end of the 1960s with pianist Dom Salvador and his group, which merged the samba with American funk, which was then newly arrived in the Brazil. With the departure of Dom Salvador to the United States, the band broke up, but at the beginning of the 1970s, some ex-members, including Luiz Carlos, José Carlos Barroso, and Oberdan joined Christovao Bastos, Jamil Joanes, Cláudio Stevenson and Lúcio da Silva to form Banda Black Rio. The new group has deepened the work of Don Salvador in the double mixture of the bar with the Brazilian samba funk of the American Quaternary, based on the dynamics of implementation, driven by drums and bass. Even after the Banda Black Rio in the 1980s, British disc jockeys began to play the group's work. It was rediscovered throughout Europe, but mainly in UK and Germany. At the turn of the 1960s to the 1970s, the young Martinho da Vila would give a new face to the traditional sambas-enredo established by authors such as Silas de Oliveira and Mano Decio da Viola, compressing them and expanding its potential in the music market. Martin popularized the style of the Partido alto with songs like "Casa de Bamba" and "Pequeno Burguês" and launched his first album in 1969. Although the term partido alto originally arose at the beginning of the 1900s to describe instrumental music, the term came to be used to signify a type of samba which is characterized by a highly percussive beat of pandeiro, using the palm of the hand in the center of the instrument in place. 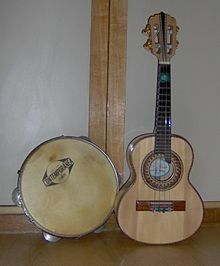 The harmony of Partido alto is always higher in pitch, usually played by a set of percussion instruments (usually surdo, pandeiro, and tambourine) and accompanied by a cavaquinho and/or a guitar. Also in that decade, some popular singers and composers appeared in the samba, including Alcione, Beth Carvalho, and Clara Nunes. As highlighted in city of São Paulo, Geraldo Filme was one of the leading names in samba paulistano, next to Germano Mathias, Osvaldinho of Cuíca, Tobias da Vai-Vai, Aldo Bueno, and Adoniran Barbosa. In the early 1980s, after having been eclipsed by the popularity of disco and Brazilian rock, Samba reappeared in the media with a musical movement created in the suburbs of Rio de Janeiro. It was the pagode, a renewed samba, with new instruments like the banjo and the tan-tan. It also had a new language that reflected the way that many people actually spoke by including heavy gíria, or slang. The most popular artists were Zeca Pagodinho, Almir Guineto, Grupo Fundo de Quintal, Jorge Aragão, and Jovelina Pérola Negra. In 1995, the world saw one of the most popular Pagode groups, the Gera Samba, later renamed to É o Tchan, come out from Savador. This group created the most sexual dance of the Pagode during the 1990s, mixing a lot of Axé music in it. Some groups like Patrulha do Samba and Harmonia do Samba, also mixed in a bit of Axé. Samba, as a result, morphed during this period, embracing types of music that were growing popular in the Caribbean such as rap, reggae, and rock. Examples of Samba fusions with popular Caribbean music is samba-rap, samba-rock, and samba-reggae, all of which were efforts to not only entertain, but also to unify all Blacks throughout the Americas culturally and politically via song. In other words, samba-rap and the like often carried lyrics that encouraged Black pride, and spoke out against social injustice. Samba, however, is not accepted by all as the national music of Brazil, or as a valuable art form. Light-skinned "upper-class" Brazilians often associated Samba with dark-skinned blacks because of its arrival from West Africa. As a result, there are some light-skinned Brazilians who claim that samba is the music of low-class, dark-skinned Brazilians and, therefore, is a "thing of bums and bandits". Samba continued to act as a unifying agent during the 1990s, when Rio stood as a national Brazilian symbol. Even though it was not the capital city, Rio acted as a Brazilian unifier, and the fact that samba originated in Rio helped the unification process. In 1994, the FIFA World Cup had its own samba composed for the occasion, the "Copa 94". The 1994 FIFA World Cup, in which samba played a major cultural role, holds the record for highest attendance in World Cup history. Samba is thought to be able to unify because individuals participate in it regardless of social or ethnic group. Today, samba is viewed as perhaps the only uniting factor in a country fragmented by political division. The Afro-Brazilians played a significant role in the development of the samba over time. This change in the samba was an integral part of Brazilian nationalism, which was referred to as "Brazilianism". Marcelo D2 frequently mixes hip hop with samba. From the year 2000 onwards, there were some artists who were looking to reconnect the most popular traditions of samba. The cases of Marquinhos of Oswaldo Cruz and Teresa Cristina, were, among others, the ones that contributed to the revitalization of the region of Lapa in Rio de Janeiro. In São Paulo, samba resumed the tradition with concerts in Sesc Pompéia Club and with the work of several groups, including the group Quinteto em Branco e Preto which developed the event "Pagode da Vela" ("Pagoda of Sail"). These all helped to attract many artists from Rio de Janeiro, which has established residence in neighborhoods of the capital paulistana. Samba was also mixed with drum and bass leading to the foundation of Sambass. Despite the evolution during the decades, Samba still remains a traditional dance, and cannot be considered a sport. In 2004, the minister of culture Gilberto Gil submitted to Unesco an application for declaring samba as a Cultural Heritage of Humanity in the category "Intangible Goods" by the Institute of National Historical and Artistic Heritage. In 2005 the samba-de-roda of Baiano Recôncavo was proclaimed part of the Heritage of Humanity by Unesco, in the category of "Oral and intangible expressions". The Samba is often performed on different dance shows, such as Strictly Come Dancing. ^ "Samba and the Frenetic Rhythm of Brazil's Carnival". www.thelanguagejournal.com. ^ "The History of Samba at the JAS Cafe Corner". 2017. ^ S.A., Priberam Informática,. "Consulte o significado / definição de samba no Dicionário Priberam da Língua Portuguesa, o dicionário online de português contemporâneo". www.priberam.pt. ^ "Free Ride". All Music. Retrieved 3 February 2015. ^ Jones, Quincy (2002). Q: The Autobiography of Quincy Jones. Three Rivers Press. p. 233. ISBN 978-0767905107. ^ "Off the Wall". All Music. Retrieved 3 February 2015. ^ "Till I Loved You". All Music. Retrieved 3 February 2015. ^ Gilman, B., "The Politics of Samba." Georgetown Journal of International Affairs 2001:2(2). http://journal.georgetown.edu/wp-content/uploads/2.2-Gilman.pdf accessed 26-4-2014. ^ Vianna H., "The Mystery of Samba: Popular Music and National Identity in Brazil" (trans. Chasteen J), University of North Carolina Press 1999. ^ "The Local and the Global in Brazilian Popular Music" Latin American Music Review 27, no. 1 (Spring/Summer 2006). ^ R.J.'s Gringo Guides, "The Roots of Racism in Samba in Brazil", retrieved 14 Feb 2008. ^ Behague, Gerard. "Rap, Reggae, Rock, or Samba: The Local and the Global in Brazilian Popular Music )." Latin American Music Review 27, no. 1 (Spring/Summer 2006). The Brazilian Sound: Samba, Bossa Nova and the Popular Music of Brazil. by McGowan, Chris and Pessanha, Ricardo. 2nd edition. Temple University Press. 1998. Samba on Your Feet by Eduardo Montes-Bradley on IMDb , documentary on the history of samba in Brazil with particular emphasis on Rio de Janeiro. The film is in Portuguese with English subtitles and approaches the subject from an interesting perspective. Nosso senhor do samba. by Edigar de Alencar. Rio de Janeiro: FUNARTE, 1988. O Encontro Entre Bandeira e Sinhô. by André Gardel Rio de Janeiro: Secretaria Municipal de Cultura, 1996. O Sol nasceu pra todos:a História Secreta do Samba. by Lui Morais [Luis Carlos de Morais Junior]. Rio de Janeiro: Litteris, 2011. Samba. by Alma Guillermoprieto. Jonathan Cape London 1990. Rhythms of Resistance: African Musical Heritage in Brazil. by Peter Fryer. Pluto Press 2000. Making Samba: A New History of Race and Music in Brazil. by Marc A. Hertzman. Duke University Press 2013. History of Samba, BBC Radio Bosco De Olivera's History of Samba for BBC Radio - scroll down to "Bosco Does the Samba".